Ashanti Regional Police Commander, DCOP Kwesi Mensah Duku, is set to hold a meeting with traders at Suame Magazine on Friday, 3 August 2018 following alleged attacks on some foreign traders. The meeting is to deliberate on restoring peace between local traders and their foreign counterparts. Class91.3FM’s Ashanti regional correspondent, Elisha Adarkwah, reported on Thursday, 2 August that the announcement was made after the police held initial meetings with the Ghana Union of Traders Association (GUTA) and the Nigerian Union Traders Association of Ghana (NUTAG), following alleged attacks by some Ghanaian retailers on Nigerian retailers. 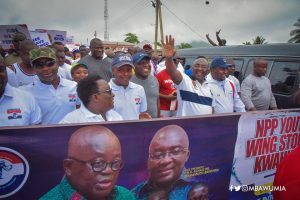 The meeting, intended to restore calm among the traders, was held separately with the two groups at the Ashanti Regional Police Headquarters. About 500 foreign spare parts dealers at Suame Magazine sought refuge at Suame police station a few days ago, alleging that they were assaulted by their Ghanaian counterparts. Meanwhile, the leadership of the Ghana Association of Garages has registered its displeasure at the behaviour of the local spare parts dealers. Ghanaian traders have been clamouring for strict adherence to Section 27(1) of the Ghana Investment Promotion Centre (GIPC) Act, which bans foreigners from participating in trade reserved for local retailers.